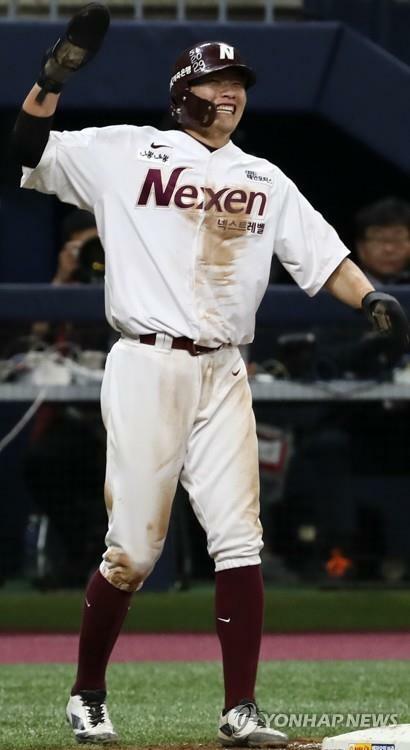 SEOUL, Oct. 23 (Yonhap) — Before his club entered the first-round playoff series in the Korea Baseball Organization (KBO), Nexen Heroes manager Jang Jung-suk said he needed a couple of players to just play out of their minds and carry the team over the top. And fortunately for the team, Jang found one such player in outfielder Lim Byeong-wuk. Coming off his best regular season, the 23-year-old picked up right where he left off, belting out two home runs and knocking in eight runs in a four-game series win over the Hanwha Eagles. Lim earned the series MVP award after the Heroes sent the Eagles packing with a 5-2 win on Tuesday. Lim added to his RBI total with a two out, two-run triple in the bottom of the eighth on Tuesday, a crucial hit that came when the Heroes were nursing a 3-2 lead. It was just the latest clutch hit for Lim, who also played the hero in Game 2 last Saturday with a pair of three-run homers. The first one put the Heroes over the top 3-1 in the top of the fourth inning. The Eagles responded with three runs in the bottom fourth for a 4-3 lead, but Lim hit another three-run shot in the top fifth for a 6-4 advantage. They went on to win the game 7-5. During the regular season, Lim set career highs across the board, with 13 home runs, 60 RBIs and 16 steals in 134 games while slashing .293/.327/.468. In four games in this series, Lim batted 4-for-11 with five runs scored and four walks. He had a .588 on-base percentage and an even 1.000 slugging percentage. Lim received 49 out of 74 votes from the media, ahead of rookie reliever An Woo-jin, who received 24 votes after earning two victories out of the bullpen. An twirled 5 2/3 shutout innings and fanned five on Tuesday, and seemed poised for the MVP honors before Lim snatched it from him with the ringing triple. Lim said he was playing extra hard for fallen teammate Lee Jung-hoo, an All-Star outfielder ruled out for the postseason after suffering a shoulder injury in Game 2.